Drop by this weekend, October 27th & 28th while you are out exploring the city during City Harvest! We’ll have our delicious Fair-Trade Organic Mexican Chiapas brewed on our Clover available for just $2+HST ! We’ll also have a small version of our incredible Pumpkin Latte, our NEW Pumpkin Cortado on special for $2.50+HST! 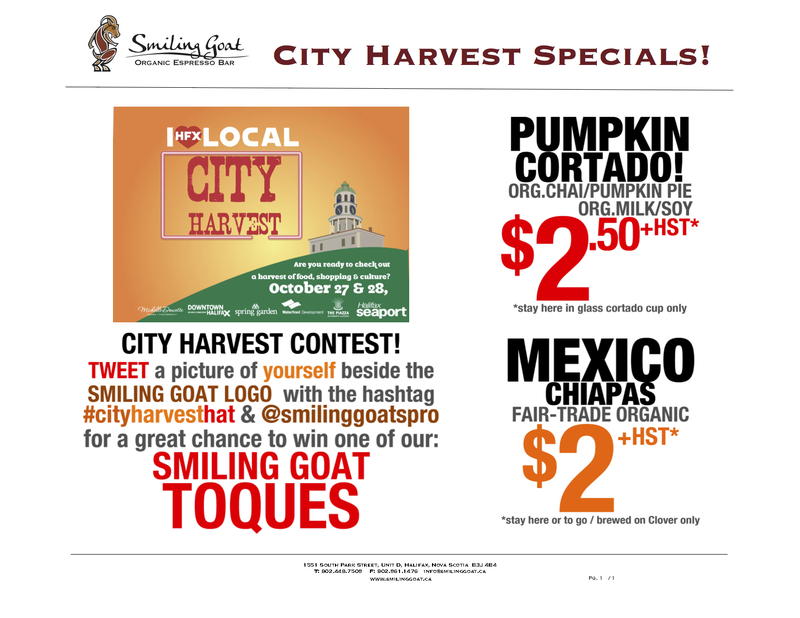 This entry was posted on October 25, 2012 at 11:40 am and is filed under Uncategorized with tags @ilovelocal, cityharvest, Fair Trade Organic, Halifax, hrm, Mexico Chiapas, Pumpkin Cortado, Pumpkin Latte. You can follow any responses to this entry through the RSS 2.0 feed. You can leave a response, or trackback from your own site.